On this blessed Jumaah, I'd like to express my sincerest thanks to ERA. I have gained so many experiences (the pleasant...the painful) that I am very grateful for. Dealing with clients and having the opportunity to meet and serve people from different walks of life. Ma shaa Allah. To everyone of you, thank you is not enough. Thank you for the trust and the understanding. For my shortcomings, I sincerely apologise. Having had the opportunity to appear on ASET on Suria alongside with high calibre agents sharing with viewers concerns and hopes with regards to property market. To be part of the Preeminent Team, a team so dynamic and fast paced you get motivated to just move along and keep going! It is time, I feel..... to get out of my comfort zone. Yes I agree that a comfort zone is a beautiful and safe place to be but we also know that if you remain in it, you will not grow. I am always hungry for new stuff. Always willing to try new things. This is my weakness. BUT, this is also my strength. Because I know that ....It is when I am uncomfortable that I will learn and grow. Yes the rumours have been circulating and today I will confirm. I have resigned from ERA. I have carefully planned my move to Propnex since the beginning of this year with E as my driving force. No I am no superwoman. My decisions are only sealed after careful discussion with my husband, family and teammates. Again I am where I am because of my family and team. Yeap! My team is also joining Propnex. Ohana....No one gets left behind. Saaaap. In all honesty, it is not a difficult decision to join Gaz Aspar's Legacy Solutions at Propnex. 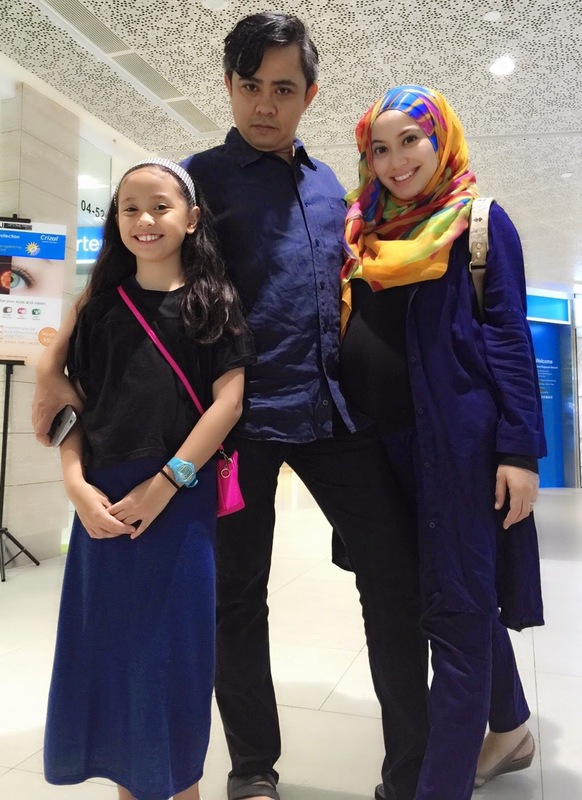 He and wife, Sharifah are forward thinking and collaborative leaders, with an art for implementing results. I am really looking forward to adding value to their team. That and Mr Ismail Gafoor CEO of Propnex, is such an inspiring man I hope to benefit from his selfless sharing and inspire me to just propel further in real estate. Really looking forward to a business environment that has forward momentum and excitement at Propnex. My handphone nunber is still the same if you want to contact me for property matters. Nyla is nominated for Pesta Perdana 13! The above Mother's Day special Telemovie was Nyla's first acting debut. E and I...We were open for her to try this role because we know that learning does not solely take place in school. We can learn anywhere and everywhere. Through play...Through sports...Through acting in this case. Nyla had many take aways from this valuable experience. The need to memorise script....The pronunciation of the Malay words....The mood......The commitment (Like having to sacrifice weekends and go to work).....The opportunity to work alongside and learn from the experienced cast. 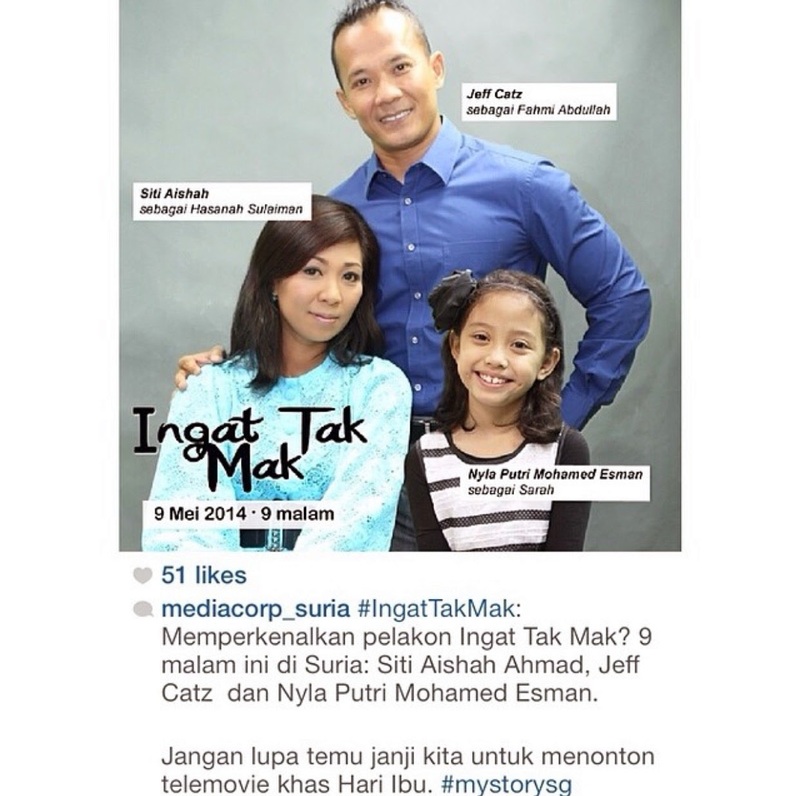 Nyla took 2 weeks to wrap up this telemovie. DV Studio was very understanding making sure Nyla's filming schedule would not affect her school such as no filming on days she had supplementary lessons/CCAs. That and they made sure Nyla would finish filming by 7pm so she could go to bed early for school the next day. With special arrangements like this, it would be a waste if we'd not let Nyla act! So thank you DV Studio and to my friend, the talented Haryani Othman who asked me to let Nyla audition for the role! When we found out Nyla was nominated in #pestaperdana13 this year, we were like, "Oh wow!" Nyla had a look at this and her first words were," I'm last place is it?" "No la Nyla. You're the top 5 nominated for this category darling!" The other kids in the category are damn good themselves so I've been telling Nyla not to have too high hopes. I mean to be nominated is already something to be grateful for so we will be enjoying the night to celebrate the deserving talents! She's a chillax kinda kid so it was easy. Me: Then you will have to make a speech. Nyla: WAH LIKE THAT I DON'T WANT! WHAT DO I SAY? SO SCARY! SUFYAA will be our choice with regards to dressing us up. I know la it's Nyla's night but I'll be accompanying her mah so I also need to look presentable pe. I'm jut hoping I can get 1 ticket for E as well! Anyway, the other time when I appeared on Selamat Pagi Singapura pon Sufyaa yang sponsor. LOVE LOVE LOVE their style. My type la. We have already gone down to their showroom to take our measurements for our #sufyaabespoke last week. That's their designer there. Young and "She's so pretty, mommy!" Plus talented. Tu ah. Dah gini pon masih ada hati nak measure waist kan. So come 28 March, we will be attending this very prestigious Pesta Perdana 13 awards ceremony. Nyla: Mommy if I win la ah, can I say, "Nyla happy menang. I will thank la the team all then I say Mommy, this is for you! I menang untuk you! Sooooooo awwwwwwww boleh nangis kan.
"Cos you never win before plus never get nominated before. Somemore you're older than me." Terus terguris seh hati I. Me: Nyla, that is tak baik. Nyla: Giggling. But true what.... continues giggling. Nyla and I... we will be among the 30,000 who will be watching these boys come tomorrow. We started liking them after watching the boys' "This is us" movie so imagine our excitement when we found out these lads are coming to Singapore! As you can see, Nyla even did a flatlay on her #ootd for the 1D concert. I givvup on E. Any modelling agency out there keen to sign him up? He's got the grooooveeeee. Tyra Banks sure approve. Me: But Nyla, you just wore this same outfit last Sunday! Nyla: Ya la! I know. Sunday I testing la tu. Comfortable so it's ok to wear for 1D concert. Me: Oh actually kan, if you wanna be a fashionista, try not to repeat the clothes you're wearing tau. No response which means she doesn't get it la. Anyway, we were at my mom's last week and I was telling Nyla to memorise all songs so she can sing along to the boys tomorrow. Me: Babe, make the concert worth it k! No such thing as humming along to them. Sing along! So you better memorise their songs!!! Ish.....Kalau memorise surah surah kan lebih bagus. That sudden burst of intensive cleaning and organising your home. No no its not a IM SO BUSY I HAVE NO TIME! kinda situation. I have become very productive I'm actually scaring my teammates. Alina: Scary sia you now. Become so ON. Ya she and Saat and Chris got so scared all left me here alone to settle property matters while they take 3 weeks leave from work. Thanks guys. You alls are the bestest friends ever. You know I'm in a state where I would very much just like to lie down and you all do this. Hahaha. No la am kidding. Alamak lapar seh tengok makanan Puncak. So the person who is extra busy will actually be him because he has to juggle school and having to ferry me around. If E is really busy (especially now that the school term is coming to an end) then another person to be activated will be none other than Papa J.
Tapi ini service ada mahal sikit cos kena hulur. LOL! Not that he asked la but macam tak sedap kan.
And everytime I hulur, he will always say,"Eh no need la! You ah Kin...."
Ya talk and action very contradicting I know kan. Anyway, its the CA week and I've been studying Science can you believe it whenever I have spare time in between. Hate Hate Hate process skills kinda questions when you need to really think. Why can't the question be the generic kind like: "What do plants need to make food?" Then you memorise facts and then you just vomit out the answer. Now the question is like:"Although the plant looks healthy, its stem is slanting towards the right. What can you do to make the plant be upright again?" Ok la I nak pi breakfast, recharge and be productive for later.